Here are some of our essential hair care tips for managing dry and damaged hair. Brushing your hair – using a quality bristle brush will help smooth out your hair and distribute your hair’s natural oils evenly. Braiding your hair loosely – this will help you avoid nasty knots and tangles in the morning. Sleeping with dry hair – wet hair is very delicate and much more prone to breaking and frizzing. Using a satin or silk pillowcase – both fabrics have reduced friction that can prevent the build-up of heat which causes split ends. 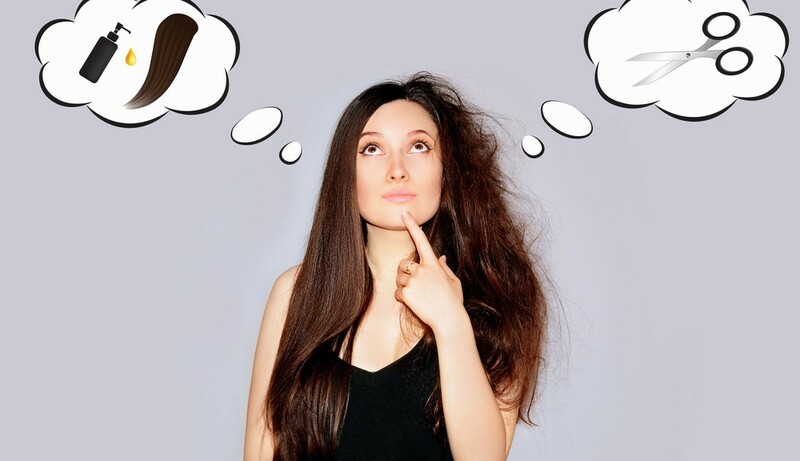 Try to avoid yanking your hair when lathering, and don’t scrub with your fingernails – this will not only irritate your scalp but cause hair breakage. Give yourself a gentle scalp massage when washing which will help stimulate your skin’s oil glands. Use a salon-grade shampoo and conditioner for ‘dry or damaged hair’ and check the label for a PH level – between 4.5 and 6.7 is a good indicator. Try and use products that don’t contain alcohol which will dry your hair out even more. Wash your hair thoroughly then apply a small amount of deep conditioner to your hand. Apply the amount evenly on the tips and bottom half of your hair avoiding your scalp. Leave the conditioner in for 15 minutes then apply a bit of heat to help it infuse – a warm towel fresh from the dryer works a treat. Rinse your hair thoroughly with not-too-hot water and avoid shampooing for a few days to really see the benefits. Use an overnight conditioner once in a while – just don’t forget the hair wrap or shower cap! After conditioning, don’t rub your wet hair – this will produce friction and dry it out too fast which can lead to breakages. Blot your wet hair with a towel instead and avoiding brushing it while still damp. Brush your (dry) hair correctly – split your hair into three sections (one at the back, and one on each side) then brush each one slowly and individually starting from the roots and working your way down to the bottom. Be cautious when it comes to using hot styling tools – applied heat can fundamentally change hair and in some cases burn it. Know your hair dryer – don’t use it on a hot setting, blow dry down the hair shaft and at least 15 centimetres away from your hair. Know your hair – fine hair requires a lower temperature whereas thicker hair can normally withstand more heat. A healthy diet is also beneficial for treating dry and damaged hair. Eat lots of foods containing calcium, B Vitamins and Omega-3 fatty acids, which are found in seafood, nuts and seeds and plant oils like flaxseed and canola oil. And of course, drink plenty of water! Although we all love a swim, unfortunately being outdoors does come with a few downsides if you’re trying to manage dry and damaged hair. The chemicals in chlorinated water in particular can wreak havoc on the natural oils in your hair, so make sure you shower before and after hopping into the pool. Better still? Use a swimming cap. Long bouts of sun exposure can also damage your hair’s cuticles and lead to split ends. Consider using a hair sunscreen or just wear a hat – that way you’re protecting both your hair and your face. Dry and damaged hair loves nothing more than a bit of TLC to bring it back to life. Booking in for a regular trim with your hair stylist can assist with heat and chemical damage, particularly because many of these issues affect the lower part of your hair. It’s a quick and easy fix! And while you’re here, why not consider revamping your look with foils or a new colour treatment or pamper yourself with one of our intensive hair spa treatments? Want shiny, glossy hair in a few hours? It’s all yours! Need to give your dry and damaged hair a bit more TLC? Contact COEV Hairdressers now on (07) 3844 4766 or book your appointment online! Previous Post6 Amazing Hair Care Tips for AutumnNext Post5 Natural Hair Remedies That Actually Work!